For information about Schuyler, Virginia, please go to The Walton's Mountain Museum and for information about the beautiful countryside, activities, and events surrounding Walton's Mountain, click on Nelson County, Virginia. For information about Walton's Mountain Country Store, located at 6401 Rockfish River Road, Schuyler, Virginia 22969, please go to Walton's Mountain Country Store, The Store stands on the original location -- called "The Shed" -- where Earl Hamner wrote the series "The Waltons,"
My two-day trip begins as I follow Highway 29 north, past the Rockfish River Road, until reaching Route 6. I turn the car into Route 800 that leads to the village of Schuyler from the north past the entrance to the New World Stone Company. As I climb a short incline I observe a small sign Walton's Mountain Museum, with an arrow pointing to the right. I'm almost there ... the birthplace of the popular television series The Waltons. Earl Hamner lived his childhood in Schuyler, and based his stories on the people that lived and worked in this area at the foothills of the Appalachian Mountains. These series of photographs were taken the last week in September 1999. The museum, on Rt. 617 and Rt. 800 in Schuyler, is open 7 days 10 a.m. to 4 p.m, March to November. A small admission is charged. Admission to the museum is free if you are a member of The Friends Of The Waltons. Membership to the group will "support the work of The Museum in perpetuating the family values represented by the TV series". Walton's Mountain Museum, P.O. Box 124, Schuyler, Virginia 22969. Their telephone number is 804.831.2000. Coming upon the "T" intersection of Route 800 and Route 617, the Schuyler Baptist Church appears to my left and the Hamner home stands in front of my car and a little bit to the right. Turning right onto Rockfish River Road, the Walton's Mountain Museum appears to me only down the road a bit. Earl Hamner Jr. created the story behind the Waltons television series based on his own family's experiences growing up during the Depression era in this rural village of Schuyler. The school building he and his brothers and sisters attended has been converted to a museum that contains nostalgic memorabilia, replicas of the sets created for the TV series, and an audio-visual presentation. 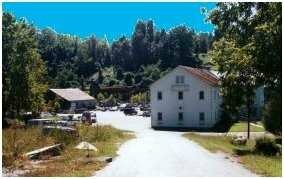 The people of the Walton's Mountain Museum can be reached at (address) Post Office Box 124, Schuyler, VA 22969, (phone) 804.831.2000, (URL) http://www.waltonmuseum.org. On August 14, 1999 the radio used on The Waltons was brought to the Museum for two or more years, while on loan from the Smithsonian Museum. We owe our gratitude to Dee Davis-Wells for her "vision and persistence in bringing this dream to fruition" and to John Olvey for "helping to raise the substantial amount of money it took to provide all the safeguards the Smithsonian insisted we take to keep the radio safe". 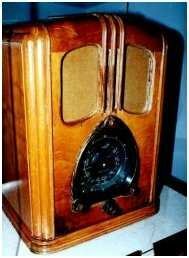 The following is an excerpt (Blue Ridge Chronicles, Fall 1999) from the remarks of Earl Hamner at the unveiling ceremony of the Walton's Radio: "During the run of the series this radio sat in a prominent spot in the living room of the Walton set. On the television the radio was a constant companion to everyone in the family. It announced to the Waltons as radio did to every American family of those days the great and small events as they happened. It brought good music into our lives, all the news of the day, and entertainment we could listen to without worrying if it was okay for the children to hear. One of my favorite images of those days is of the entire family sitting in the living room listening to the radio." Inside the museum I find the Walton's Living Room. 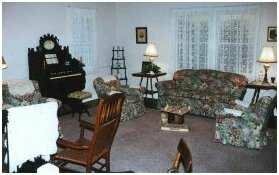 It is a 1930s style family room with fireplace, sofa, piano, old Atwater Kent radio, stuffed chairs, and other period furnishings. 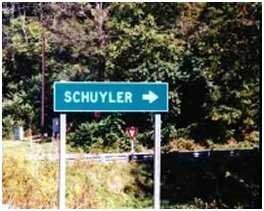 Schuyler is a hamlet near the foothills of the Blue Ridge Mountains with a population of about 400. It is located within Nelson county in central Virginia, south of Charlottesville off of Highway 29. Taking Route 800 north out of town and east on Route 6 leads to "Scottsville", about 15 miles away. Going west on Route 6 leads to "Waynesboro", about 30 miles away. Taking Route 617 west out of town leads to "Rockfish", about 5 miles away. Further on Route 617 and south on Highway 29 leads to "Lynchburg", about 40 miles away. Further along my tour I find the Walton's Kitchen. 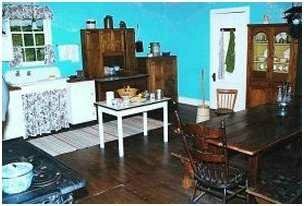 It features a long table and benches at which the family had supper, an old wood cook stove, period cabinet work, an antique hutch, and a wooden ice box and butter churn. 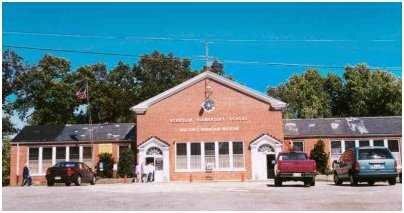 The Schuyler school was closed by the Nelson Country School Board in 1991, thus becoming the town's Community Center. Early in 1992 the activities in the Center increased to a point where additional funding was needed. With permission and support from Schuyler's most renowned resident, Earl Hamner, Jr., a museum was planned within the Community Center to utilize and celebrate the critically acclaimed and widely popular television series of The Waltons. My next visit finds me inside John-Boy's bedroom. 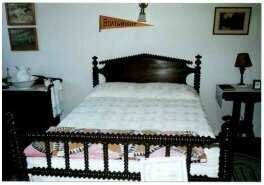 It is furnished to look just like the bedroom where the writer retreated to jot down in his tablet. This room has 1930s period furniture and an old Underwood typewriter that Earl Hamner Jr. actually used when he began writing. Beginning in April and until the opening on October 24, 1992, work was completed that transformed the Center to The Schuyler Community Center and The Walton's Mountain Museum. Since then people from every state and over twenty countries throughout the world have toured the Museum. Through admissions and sales has provided local benefits for Schuyler in the form of a food bank, a literacy program, support for the fire and rescue squads and senior citizens, playground equipment, and programs for the children, scholarships for the high school children, support of a health clinic and the library. Also contained within the Museum is Ike Godsey's Store, a favorite for many visitors. People can re-live the warmth of an old country store complete with drink box, scales, barrels of penny candy, and other merchandise not found in stores today. The room doubles as a gift shop with locally produced craft items and articles pertaining to The Waltons. I walk down the road to outside the Hamner home (white in color like the Walton House). 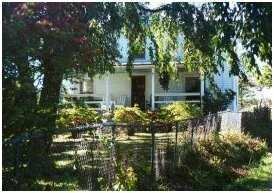 Earl, Sr. and Doris Hamner raised eight red-headed children in the white wood frame building. Doris was fond of saying that she "could afford eight children but CBS could only afford seven". (Blue Ridge Chronicles Fall 1998) Earl, Sr. died on May 1, 1969, and his wife Doris followed him on August 31, 1990. James E. Hamner, who is portrayed by David Harper as Jim Bob, now lives in the home place across from the Museum. "He came out of the orchard, crossed the road and, standing under a wisteria-covered arch that covered the front gate, he looked up at his home. It was the same house his father and mother had moved into when they were married. At first Clay had objected to doing anything to improve the place because they would only be there long enough for him to build his own home on Spencer's Mountain. But then as the children came along and the house on the mountain was slow in materializing, Clay and Olivia had done their best to make the company-owned house into a home. Clay had painted the house and laid a flagstone walk from the front steps down to the front gate. He had put up a fence of sturdy locust posts and heavy wire to keep the children from running into the road that ran in front of the house. He had gone into the woods and brought back young maple trees which now had grown to thirty- and forty-foot shade trees. To the practical improvements Clay made, Olivia added beauty. Bordering the entire yard were her flowers - iris, petunias, daffodils, crocuses, black-eyed Susans. All along the fence ran roses which Olivia had raised from cuttings she had gotten from her neighbors. Over the arch Clay had built for her she trained a wisteria vine that was filled each spring with heavy scented clusters of purple blossoms." Marion Hamner Hawkes wrote in the Waltons Digest (30-00) by Karen Kearney. In answer to the question about the ages of the children in the Walton's series.� I cannot give you the vital statistics of the cast but I can tell you the birth order of the children in the Hamner family. Both parents are dead.� Mother died August 31, l990 and Dad died May 1, l969. I hope this will help to clear up some of the birth order that seems to come up from time to time.� Thanks for your Digest which I enjoy each week. Traveling east a block or so on Rockfish River Road you will notice off to the right in a small valley the Schulyer Baptist Church. In The Waltons this church was known as the Walton's Mountain Baptist Church, whose first minister was Rev. Matthew Fordwick played by John Ritter. 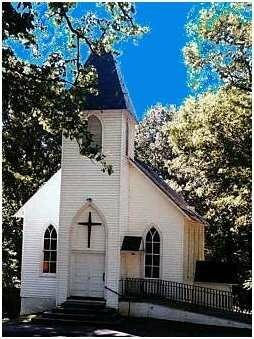 The stories Earl Hamner describe derive from his boyhood recollections of his own family's life in his Blue Ridge birthplace, that included the Baptist Church. Sunday School begins at 9:45 a.m. with Worship Service at 11:00 a.m. Wednesday evenings at 7:30 p.m. are dedicated to the prayer meeting and choir practice. As one drives west about two blocks on the Rockfish River Road the charming white New Faith Methodist Church stands on the left among several tall trees. In The Waltons the Methodist church is located in Rockfish whose minister is Rev. Caldwell (from season five, episode thirteen). The original church was built in 1914 with timber cut from a local farm and most of the work performed by volunteers. 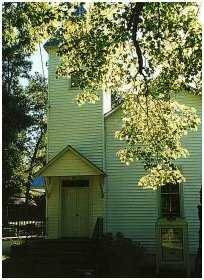 At this time the church was known as the Bethel Methodist Church. The name changed in the 1980s when it consolidated with other area churches. The church provides a large shelter for picnicking and outdoor meals. A walking trail with meditation areas is also available to the community as well as the congregation. 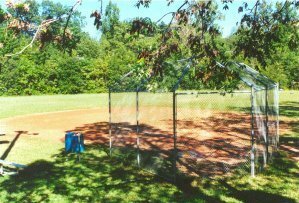 "It's late now in Virginia, that ball field which once echoed to the sounds of our games is quiet except for the call of crickets and the ghosts of the children we were. For my brothers and sisters and I are all grown now, and our children play other games in places far from Walton's Mountain. Still, there's something about the fall of night that turns our thoughts homeward". The New World Stone Company is located at Route 800 and Alberene Loop. The stone company is the only source for Virginia soapstone. It is located on the site of the historic Alberene Stone Company and offers a wide range of custom architectural, decorative, and landscaping products, as well as soapstone slab and sculpting stone. In 1880 quarrying operations were undertaken in Albemarle county and The Alberene Stone Company was established. The corporation owned and operated one of the country's largest stone finishing mills and quarries. The soapstone business and the village of Schuyler flourished at the beginning of the 20th century. Besides the finishing plant, there was at one time a company store, company houses, and a post office within the Alberene Stone Company. One employee of the company was Earl Hamner, Sr. The New World Stone Company's telephone number is 804.831.1051.